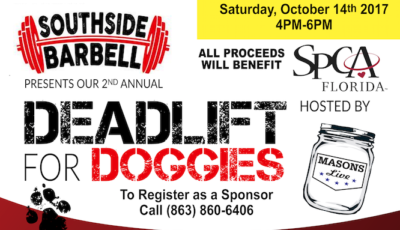 On Saturday, October 14th, 2017 we hosted our 2nd Annual Deadlift for Doggies ASPCA Charity event. All of the proceeds that were collected to benefit the ASPCA in Lakeland, FL. It was hosted at Masons Live this year and we had a great turn out! We want to say THANK YOU to all of the sponsors and participants who made this event possible! Our 2017 Sponsors: MosierData, Atlas Cruises & Tours, Envoy Mortgage, RE Concrete Pumping, LLC, Beard Booze, Rita Staffing, Smoothie King, Gladiator Addicts.